Create your own chenille fabric easily cut multiple layers of fabric to add texture and dimension to any project Features 4 channel guide sizes for narrow to wide widths 18", 14", 38" 12". Long lasting, ultra sharp, double honed edge blade made from high quality tungsten carbide tool steel. 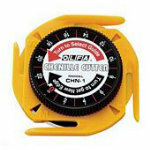 Uses only Chenille Cutter Replacement Blade CHB1.